THe John Deere p/n is L4111T. The INNER diameter of this ring gear is aprox. The picture is FILE picture only, they all look alike so I use one picture for all of my ring gear auctions and they only use one ring gear as described in description to fit the application as described in description. 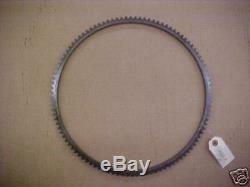 The item "FLYWHEEL RING GEAR FOR John Deere Tractor L, LA & LI #L4111T" is in sale since Tuesday, July 23, 2013. This item is in the category "Business & Industrial\Heavy Equipment Parts & Accs\Antique & Vintage Equip Parts". The seller is "bakt4kids" and is located in Wauseon, Ohio. This item can be shipped worldwide.